It’s no secret that Amazon has become a giant of commerce. Today, Amazon represents nearly 44 percent of the US retail e-commerce market and about 4% of all US retail sales. In 2016, the company alone accounted for 53 percent of all retail e-commerce growth. Along the way, it has added e-commerce product categories (e.g., appliances, furniture), private label brands (e.g., AmazonBasics), offline retailing (e.g., Whole Foods, Amazon Go stores), geographies (e.g., Souq.com acquisition in the Middle East) and home/business services sold online (e.g., home maintenance). And, of course, Amazon Prime has reoriented consumer behaviors and expectations. Source: Wall Street Journal and Statista.com data. 2017 employment figures as of September 2017. While growing these retail businesses, the company has established an impressive information technology capability (e.g., Amazon Web Services, artificial intelligence), logistics know-how and physical infrastructure (e.g., 70+ US fulfillment centers, Kiva robotics, Fulfillment by Amazon). An estimated 44 percent of the US population is now located within 20 miles of an Amazon warehouse, up from five percent just three years ago, based on Piper Jaffray research. Introduced its own 3PL offering, Fulfillment by Amazon (FBA), in 2006. Initially targeting smaller Amazon Marketplace sellers, this offering has now matured into a massive fulfillment network powered by Amazon Prime. FBA delivered more than 2 billion items in 2016. Continues to invest heavily in its logistics technology – Amazon was issued 80 logistics-related patents in 2016, according to CB Insights. Seeks to shrink its reliance on 3PLs, moving to insource more activities and volumes. While the company continues to be a significant buyer of 3PL services, it has also established itself as a logistics operator. Amazon is now a licensed NVOCC, has purchased branded semi-trailers, developed an air cargo hub in Kentucky and operates a “Prime Air” cargo jet fleet. In doing so, Amazon has become a fierce competitor for fulfilment center space, labor and supply chain management talent. At the same time, many 3PLs are seeing business with their traditional retail customers decline or evaporate as Amazon’s market share and market power have grown. This is indeed a scary new world for logistics service providers. What’s to be done? 3PLs can take bold, confident and proactive steps to ensure their own (and their customers’) businesses remain relevant and prosperous. In this Brief, we offer potential strategies and actions for your 3PL business to consider as Amazon continues to expand its footprint locally and globally. We have witnessed and helped 3PLs understand their unique situation and seek new strategies and markets. The objective may be to seek out niches relatively impervious to Amazon, harness special capabilities not in Amazon’s wheelhouse or otherwise strengthen strategic control and customer loyalty. Enabling your customers’ multi-channel distribution strategy. Many brands are wary of Amazon and seek to retain their own online marketplace, bricks-and-mortar outlets and independent fulfillment network. To be successful, these companies require highly capable, “one-stop shop” 3PL partners for both store replenishment and delivery of online orders. Example: A European fashion-focused 3PL establishing an e-commerce order fulfillment center within its existing retail store/wholesale DC. Building upstream first-mile supply chain/manufacturing logistics capabilities. Optimal supply chains for many manufacturing companies have become global and are likely to remain so. For sure, developments in 3D printing and other technologies (noteworthy is Amazon’s 2016 patent for an apparel/fashion-focused on-demand manufacturing system) will bring some manufacturing operations closer to customers. However, manufacturers still seek 3PL partners experienced in managing complex global challenges related to first-mile raw materials and component logistics services, inbound to manufacturing, and in-plant services. Example: A 3PL acquiring a logistics company with a specialization in cross-border transportation of auto parts and in-plant production parts sequencing. Targeting industrial sector logistics. These sectors offer opportunities to diversify your business. We have seen 3PLs take expertise honed in retail and consumer sectors and successfully apply it to industrial customers in innovative ways. Example: A consumer sector-focused 3PL investing in a packaged chemicals order fulfillment capability for a manufacturer faced with increasing demands for short lead-time and small order deliveries of specialty chemicals. Forging businesses in emerging economies. Many of these economies are in need of 3PLs with developed-market know-how and are not in Amazon’s sights. These markets have a growing middle class eager for a wider product assortment, including refrigerated and frozen items, low prices and more convenient shopping options – all which require more efficient distribution. Example: A private equity investor injecting growth capital into a 3PL building a cold chain network in an emerging economy. Expanding your value proposition with an LLP offering. Lead Logistics Providers (LLPs), sometimes referred to as 4PLs, play a broader role, managing large portions, if not all of a customer’s supply chain. LLPs contract and manage other 3PLs, as well as their own services. Example: A 3PL developing supply chain control tower capabilities that integrate visibility, performance measurement, alerting and an optimization engine – then bringing it into an existing customer relationship to manage not only its own 3PL services, but also those of the customer’s other 3PLs. Joining the Amazon logistics ecosystem with a unique offering. Amazon knows it can’t do it all itself. Its expansion into furniture utilizes 3PLs to execute last-mile deliveries and in-home set-ups. Similar 3PL specialists will be leveraged as it adds new product lines, whether pharmaceuticals, alcohol or other categories with unique logistical challenges. Another opportunity could be extending Amazon’s reach to markets it doesn’t directly serve. Example: A 3PL providing consumers in Central America with a Miami-based Amazon.com order mailbox/collection center, customs processing, expedited international air shipments and in-country home deliveries. Thinking and acting like (or better than) Amazon. Supply chain and logistics technology startup funding has seen explosive growth, reaching an estimated $5B in 2016, up from just $300M in 2012, according to CB Insights. A plethora of firms are seeking disruptive, digital solutions to age-old logistics problems, hoping to overturn traditional 3PL business models. Example: A well-funded 3PL start-up building a full-service digitized international freight procurement platform and a marketplace targeting shippers’ use of traditional freight forwarders. Launch a strategic business review. How robust is your business strategy for this new world? Is your organization aligned around clear and relevant objectives? Are customer and investment decisions well-grounded in strategy? Take a fresh look at your customer base. What is your mix of revenues and profits across customers and industries? Are services adapted to each customer segment? How exposed are you and your customers to Amazon’s ever-expanding product line, market and 3PL ambitions? Collaborate with your customers. Your customers are likely asking themselves the same questions and also seeking new strategies – how are they thinking about Amazon? How can your services help them achieve their goals? Form an internal new business incubator. Do you have adequate resources focused on developing new products, services, markets and customers? How can these efforts be organized and managed, to perform with the nimbleness of a startup? Build and develop your talent. 3PLs are in a battle for logistics and supply chain talent at all levels – are your recruiting and talent management programs doing the job? Stay informed. It is an exciting time for 3PLs, with the pace of change and innovation accelerating, driven by companies like Amazon and a host of technical advancements from artificial intelligence to block chain. 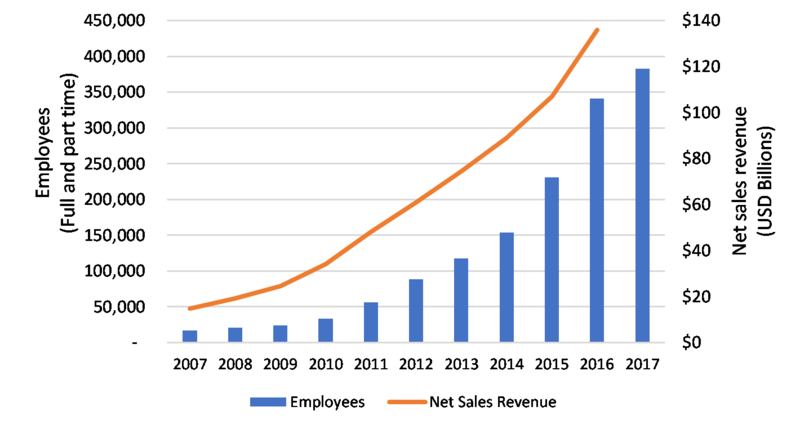 Amazon continues to grow and innovate at a staggering pace. 3PLs must accelerate their own thinking and actions to ensure their businesses and those of their customers remain relevant and prosperous. David Frentzel is a Partner at New Harbor Consultants. Dave brings 25 years of management consulting and hands-on executive leadership experience to improve business outcomes. Prior to joining New Harbor, he held senior positions at 3PL and supply chain technology companies. Dave has extensive global management expertise, having spent more than ten years living and working internationally helping companies with their global go-to-market, organizational, sourcing, manufacturing and supply chain strategies and operations.